A quick and easy appetizer, perfect for those last-minute dinner invites. Place ciabatta slices on baking sheet, brush with olive oil and bake at 350° for 10 minutes or until lightly toasted. Remove bread from oven, let cool. Mix ricotta, pesto, salt and pepper in small mixing bowl until well incorporated. 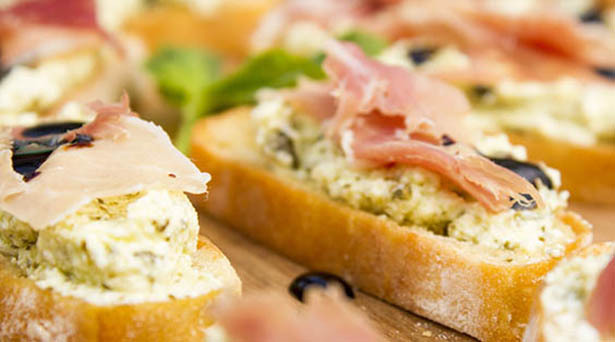 Spread each crostini with ricotta and pesto mixture, approximately one tablespoon per slice. Cut or tear prosciutto into small strips and place on top of cheese spread. Place crostini on serving platter. If desired, garnish with fresh basil sprigs and balsamic syrup.